December 30, 1983, marks the completion of ten remarkable years in the administration of President Spencer W. Kimball﻿—a historic decade of great change, stirring missionary energy, and unbounded love. 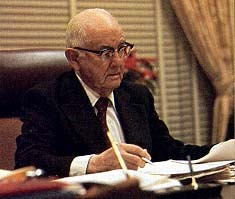 President Kimball at his Church office desk, center of a decade of energetic Church growth. Photo from early 1980s. December 30, 1983, marks a milestone in the administration of President Kimball. A decade earlier, on Sunday, 30 December 1973, he was ordained and set apart as President of The Church of Jesus Christ of Latter-day Saints in the Salt Lake Temple. He was then 78 years old. The ten years since have been a period of stunning change and growth. • Church membership has soared an estimated 64 percent﻿—from 3,321,556 members in 1973 to an estimated 5,450,000 at 1983 year’s end. • The number of stakes has jumped an estimated 133 percent﻿—from 630 stakes in 1973 to the estimated 1983 year-end total of 1,465. • The number of temples dedicated worldwide has risen a dramatic 74 percent﻿—from 15 operating temples to 26 at present. Further, 16 additional temples have been announced and are in various stages of planning and construction. • The number of full-time missionaries has surged 59 percent﻿—from 17,258 to about 27,400 at present, even with mission terms reduced to 18 months. • Correspondingly, the number of missions has climbed 62 percent﻿—from 108 to 175. And the annual number of converts is up 140 percent﻿—from 79,603 in 1973 to an estimated 191,013 in 1983. These figures, however, are only part of the evidence showing how dramatic the last decade has been. There were the historic 1975 reconstitution of the First Quorum of the Seventy, the 1976 addition of two revelations to the scriptures, the 1978 revelation on making the priesthood available to all worthy male members, and the 1979 and 1981 publications of new editions of scripture! In adding his testimony to these feelings, President Gordon B. Hinckley, Second Counselor in the First Presidency, says, “This decade of President Kimball has been remarkable in terms of Church growth, increased activity, and the strengthening of a spirit of unity among the members of the Church across the world. “The great emphasis given to missionary work by President Kimball has borne rich fruit. He has enunciated in clear and certain terms the tremendous responsibility of the Church to carry the restored gospel to every nation, kindred, tongue, and people. His views have been prophetic in this regard. The tremendous enlargement of opportunity without regard for race or color has been noteworthy, as all recognize. “His leadership has found expression in increased activity on the part of members of the Church wherever the work is established. Sacrament meeting attendance is higher, and other barometers by which we measure activity show improvement. There has been a marked expansion in the building program to provide better facilities for the implementation of the various programs of the Church. “President Kimball’s love for the people and their love for him as the prophet of the Lord and as the President of the Church have been as a catalyst in building a great spirit of unity among the membership of the Church. Love for others is of the very essence of his nature, and his outreach has touched Latter-day Saints far and near. He has embraced the whole membership in that spirit of brotherhood and mutual concern which are the very heart of the gospel of the Master,” said President Hinckley. President Ezra Taft Benson, President of the Quorum of the Twelve, says, “It is evident that he will be known as a great preacher of righteousness, a spiritual giant, a loving, compassionate, Christlike man, and an unexcelled missionary in spreading the truth to all mankind. He is truly a prophet of God, a seer, and a revelator. “Looking back over the last decade, I note at least five distinguishing features of his ministry: First, his humble dependence on the Lord, which has brought significant revelations and progress to the Lord’s Church; second, the great impetus he has given to missionary work, which has literally internationalized the Church; third, his great love and affinity for the sons and daughters of Lehi, which have encouraged thousands to come into the Church; fourth, his vision in bringing temples to the Saints who otherwise could not come to the temples, thereby greatly facilitating ordinance work for the living and the dead; and fifth, his lifting, encouraging, inspiring, and loving those Saints who were tainted by sin and to whom he showed the path to reformation and redemption. “President Kimball has not only sharpened our focus on the mission of the Church﻿—to proclaim the gospel, perfect the Saints, and redeem the dead﻿—he leads the way to its accomplishment,” President Benson said. New policy for naming stakes of the Church. New policy allowing stake presidents to ordain seventies and set apart seventies quorum presidents. New policy requiring an elders quorum in every ward and independent branch. New Young Women’s general presidency set apart. New policy for naming missions of the Church. Church divests itself of hospitals. New Relief Society general presidency set apart. New Primary general presidency set apart. New policy calling for all stakes to have a seventies quorum, for the seven presidents to constitute the stake mission presidency, and for quorums to be named after the stake. São Paulo Brazil Area Conference. Announcement of the construction of the São Paulo Temple. Buenos Aires Argentina Area Conference. General Authorities established as Area Supervisors. First Presidency statement against homosexuality. Ward Venturer and Explorer posts made optional. Stake presidents authorized to ordain and set apart bishops. Announcement of the construction of the Tokyo Temple. Taipei, Taiwan and Hong Kong Area Conference. First Quorum of the Seventy reconstituted. Lamanite and French General Authorities called. New policy allowing temple patrons to use the “approved style” garment while involved in temple ordinances. Announcement of the construction of the Seattle Temple. Two revelations added to the Pearl of Great Price. Regional Representatives given limited line authority. Announcement of the Mexico City Temple. General Authority from Holland called. First Presidency statement against abortion. First Quorum of the Seventy reorganized with the Assistants to the Twelve becoming members. First Presidency statement on the Equal Rights Amendment. New policy empowering stake presidents to call seventies, seventies presidencies. U.S. television special The Family … and Other Living Things. New policy calling for general conferences to be held in two days, with April conference no longer specifically scheduled to include April 6. Presiding Bishopric assigned as Area Supervisors. Reorganization effected at Church headquarters to place the ecclesiastical responsibilities of the Church under the Council of the Twelve and the temporal responsibilities under the Presiding Bishopric. Area Conferences in Central and South America. Dedicated country of Poland for future Church work (first visit of a President behind the Iron Curtain). Called General Authorities from Japan and Germany. Announcement of the Samoa Temple. Announcement of the Jordan River Temple. Missionary Executive Committee, including members of the Twelve, released; Missionary Department to be directed by the First Quorum of the Seventy. Rededication of remodeled Church Administration Building. Reduction in the frequency of certain ward and stake meetings. New policy calling for stake conferences to be semiannual, with one General Authority visit and one Regional Representative visit to conference per year. General Authority from England called. Adoption of controlled extraction program in genealogy. New policy calling for singles and student branches to be made wards, allowing counselors to remain elders. New south visitors’ center for Salt Lake Temple Square dedicated. Revelation announced making priesthood available to all worthy male members. Relief Society Monument to Women dedicated. Women authorized to give prayers in sacrament meetings. General Authority Emeritus designation instituted. General Authority called from Canada. Salt Lake Mission Home and the Language Training Mission consolidated into a single Missionary Training Center in Provo for full-time missionaries. São Paulo [Brazil] Temple dedicated. Area Conferences in South America. LDS edition of the Bible published. Nauvoo Illinois Stake becomes 1,000th stake in the Church. Quotas for temple attendance abandoned. New policy discontinues sacrament meetings on stake conference Sundays. Chicago and Milwaukee Area Conferences. General Authorities established as General Presidents of the Sunday School and the Young Men. Orson Hyde Memorial Gardens in Jerusalem dedicated. Authorization for the manufacture of two-piece garments. First Quorum of the Seventy reorganized to include Executive Directors of Missionary, Curriculum, Priesthood, and Genealogical Departments. First all-Church Young Women’s fireside. Temples announced for Atlanta, Georgia; Buenos Aires, Argentina; Samoa; Chile; Australia; Tahiti; and Tonga. Rochester, New York Area Conference. Authorization given for nonmembers to attend priesthood meeting. St. Louis, Missouri Area Conference. Announcement of the construction of a new Church Museum and Genealogical Library. Three-phase visiting teaching plan introduced. Unified Church curriculum established on a calendar year basis. Ann Arbor, Michigan Area Conference. Change in the age and term of service for lady missionaries and missionary couples. Area Conferences in the Far East. New edition of the Triple Combination published. New quarterly reporting system for the Church goes into effect. New policy allowing stake presidents, when specifically authorized by the Twelve, to ordain patriarchs. Temples announced for Chicago, Illinois; Dallas, Texas; Germany; Guatemala; South Africa; Peru; Philippines; Korea; and Sweden. General Authority from Argentina called. First Presidency statement on the MX missile-basing system. Gordon B. Hinckley called as Counselor in the First Presidency. Creation of three new Church Executive Councils: The Missionary Executive Council, the Priesthood Executive Council, and the Temple and Genealogy Executive Council. Temples announced for Boise, Idaho; Denver, Colorado; Guayaquil, Ecuador; and Taipei, Taiwan. Reduction of the term of service for single elders serving full-time missions. Major changes in financing Church meetinghouses, shifting construction costs to General Church funds, utility costs to local units. Temple announced for Freiberg, German Democratic Republic. Reorganization of First Presidency, following death of President N. Eldon Tanner: Marion G. Romney, First Counselor, Gordon B. Hinckley, Second Counselor. 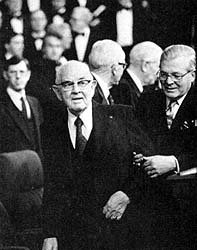 In the Tabernacle, at the May 1982 general conference; President Kimball is assisted by D. Arthur Haycock, personal secretary. Salt Lake Temple reopens after six-month remodeling. Announcement of modifications on funding the welfare program. Dedication of Assembly Hall after two-year remodeling. Fifty tons of medical supplies and food sent to Ghana, Colombia, and Tahiti, due to natural disasters in those lands. Apia Western Samoa Temple dedicated. Satellite fireside on mission of Christ, first in a series of fellowshipping/friendshipping firesides. President and Sister Kimball arriving in Montevideo, Uruguay, October 1978, for area general conference. President Kimball and President Ian Mackay of the Sydney Australia Greenwich Stake in a radio interview for seventy stations on the Australian Broadcasting Network, 1975. At Mesa, Arizona, President Kimball greets members of the Church from Guatemala and other Central American countries, November 1975. President Kimball meets Fugia Nara, oldest member of the Church in Japan, at the October 1980 Tokyo Temple dedication. Speaking at the October 1980 Seoul, Korea Area General Conference; President Kimball is assisted by a translator. Rexburg, Idaho, June 1976, shortly after the Teton Dam disaster; President Kimball inspects conditions accompanied by Church, civic, and government leaders.